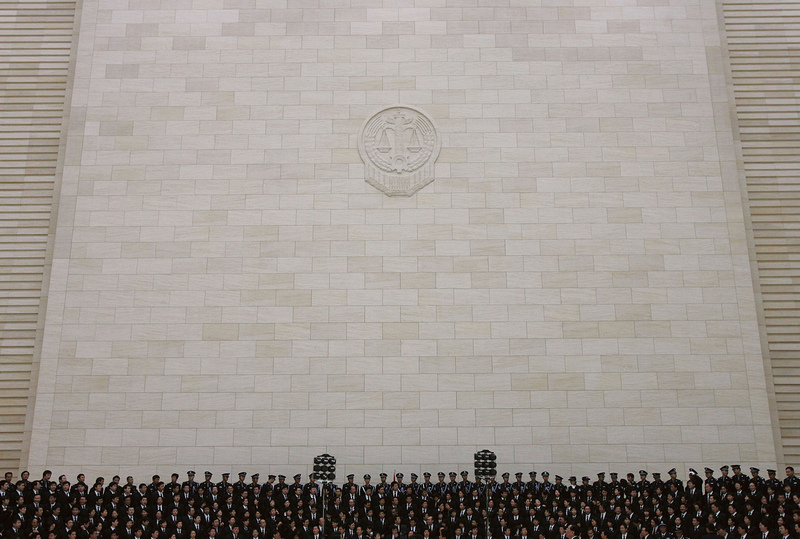 Judges and judicial policemen of Beijing High People’s Court pose for pictures during an unveiling ceremony of a new building of the court in Beijing, September 29, 2005. The Xinhua article starts with conclusions about progress in “judicial protection of human rights,” such as “improving the judicial accountability system,” enhancing the ability of lawyers to “play a bigger role in safeguarding the legitimate rights and interests of parties concerned,” and implementing the principles of “presumption of innocence and exclusion of unlawful evidence.” No illustrations, simply statements. The Xinhua article does not discuss systemic problems in handling cases generally in the criminal process. Police and prosecutors hold greater power than the courts. Although the three agencies are supposed to be independent, in the event of disagreement before the conclusion of a case they consult with each other privately—or as one Chinese judge put it, “the police, the judge and the prosecutor are in one family.” In addition, the local party committee and government officials may intervene in other cases, such as those involving illegal seizures of land by local governments for sale to developers, or cases involving government officials. Because of the pervasive Party-state emphasis on fighting crime, argues legal scholar Pitman Potter, China’s “legal system is primarily about criminal law enforcement in pursuit of social control.” A powerful illustration:from 2013-2015 less than one percent of all criminal cases resulted in not-guilty verdicts. There are pressures on defense lawyers arising out of Chinese cultural norms that stress the importance of cultivating and maintaining personal relationships—which sometimes leads to corruption and bribery. Lawyers who are identified as “rights defense lawyers” encounter outright repression. An outstanding example is the cruel and arbitrary treatment of many of these lawyers: On July 9, 2015 a nation-wide crackdown was carried out when around 300 rights lawyers, legal assistants, and activists were rounded up. Most were interrogated and released, but roughly 40 were taken into custody. By July 2017, a few of the lawyers were still imprisoned, while most of the cases were closed. Others were given suspended sentences, held in custody after they were arrested, or were under strict surveillance after being released on bail. The courts’ handling of many cases is still marked with a Maoist stamp. And yet incremental reforms, some experimental but not yet fully adopted, are also under way. These include new rules on procedure that are intended to protect the rights of litigants, and experiments thatare being conducted to expand a “hearing-centered procedural system” in which judges are allowed to adjudicate cases finally, rather than issuing opinions that are reviewed by higher-level superiors or an adjudication committee of senior judges. A project that the Supreme People’s Court (SPC) supervises has been in progress in recent years forcollecting and publishing “guiding cases” that enable judges to determine rules that are applicable to particular cases. There is not yet a comprehensive legal code or a system of precedent like that in the United States. The current imbalance between rule of law on paper and authoritarian rule by the Party-state is clear. There are forces in Chinese society that are increasingly active and may promise eventual forward movement. Economic reforms, long promised by Xi Jinping, will have to be supported by a stronger legal system, but for the present, in the view of one expert, “reform is happening in China at two speeds. On the one hand, reform is moving fast in banking and finance. . . On the other hand, reform is happening very slowly, if at all, in the real economy,” where, for example, reform is needed of state-owned enterprises. In addition, rights-consciousness has been increasing among Chinese at all levels, reflected in growing numbers of labor strikes and protests.According to Caixin, investor activism is increasing, shown by a recent rise in lawsuits relating to securities fraud and the appearance of a pilot program to support class-action lawsuits. Millions of Chinese yearn for a belief system other than Communism to fill the current moral vacuum. The rise of Christianity links to the desire for social justice. Other religions also stimulate social consciousness: A recent article links the revival of Taoism to strong pressure for environmental reforms. I began writing this article on the day on which the death was announced of Liu Xiaobo, China’s heroic leader in a struggle for human rights and the rule of law. That struggle will undoubtedly continue, despite efforts to suppress it.